IT WAS AN ORDINARY TUESDAY NIGHT WHEN EVERYTHING WENT DARK. For five million BlackBerry users, email turned eerily silent. “I quit smoking twenty-eight years ago, and that was easier than being without my BlackBerry,” one sufferer told the The New York Times. That was in 2007, predating iPhones, Kindles, and tablets. Since then, our culture of connectivity has only intensified email’s ability to dominate the workdayand the night and the weekend and everything in between. 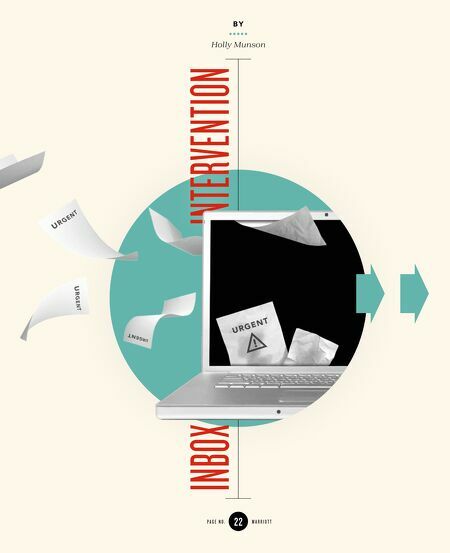 If you’re in need of some email rehab, don’t despair. There are compelling reasons we succumb to the allure of email. 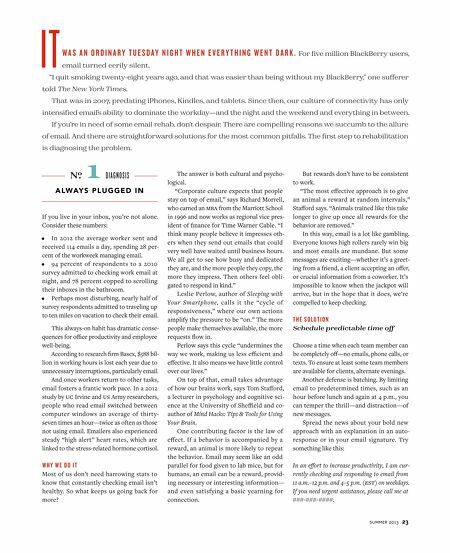 And there are straightforward solutions for the most common pitfalls. The first step to rehabilitation is diagnosing the problem. No. 1 Diagnosis ALWAYS PLUGGED IN If you live in your inbox, you’re not alone. Consider these numbers: In 2012 the average worker sent and received 114 emails a day, spending 28 percent of the workweek managing email. 94 percent of respondents to a 2010 survey admitted to checking work email at night, and 78 percent copped to scrolling their inboxes in the bathroom. Perhaps most disturbing, nearly half of survey respondents admitted to traveling up to ten miles on vacation to check their email. This always-on habit has dramatic consequences for office productivity and employee well-being. According to research firm Basex, $588 billion in working hours is lost each year due to unnecessary interruptions, particularly email. And once workers return to other tasks, email fosters a frantic work pace. In a 2012 study by UC Irvine and US Army researchers, people who read email switched between computer windows an average of thirty-seven times an hour—twice as often as those not using email. Emailers also experienced steady “high alert” heart rates, which are linked to the stress-related hormone cortisol. WHY WE DO IT Most of us don’t need harrowing stats to know that constantly checking email isn’t healthy. So what keeps us going back for more? The answer is both cultural and psychological. “Corporate culture expects that people stay on top of email,” says Richard Morrell, who earned an MBA from the Marriott School in 1996 and now works as regional vice president of finance for Time Warner Cable. “I think many people believe it impresses others when they send out emails that could very well have waited until business hours. We all get to see how busy and dedicated they are, and the more people they copy, the more they impress. Then others feel obligated to respond in kind.” Leslie Perlow, author of Sleeping with Your Smartphone, calls it the “cycle of responsiveness,” where our own actions amplify the pressure to be “on.” The more people make themselves available, the more requests flow in. Perlow says this cycle “undermines the way we work, making us less efficient and effective. It also means we have little control over our lives.” On top of that, email takes advantage of how our brains work, says Tom Stafford, a lecturer in psychology and cognitive science at the University of Sheffield and co-author of Mind Hacks: Tips & Tools for Using Your Brain. One contributing factor is the law of effect. If a behavior is accompanied by a reward, an animal is more likely to repeat the behavior. Email may seem like an odd parallel for food given to lab mice, but for humans, an email can be a reward, providing necessary or interesting information—and even satisfying a basic yearning for connection. But rewards don’t have to be consistent to work. “The most effective approach is to give an animal a reward at random intervals,” Stafford says. “Animals trained like this take longer to give up once all rewards for the behavior are removed.” In this way, email is a lot like gambling. Everyone knows high rollers rarely win big and most emails are mundane. But some messages are exciting—whether it’s a greeting from a friend, a client accepting an offer, or crucial information from a coworker. It’s impossible to know when the jackpot will arrive, but in the hope that it does, we’re compelled to keep checking. THE SOLUTION Schedule predictable time off Choose a time when each team member can be completely off—no emails, phone calls, or texts. To ensure at least some team members are available for clients, alternate evenings. Another defense is batching. By limiting email to predetermined times, such as an hour before lunch and again at 4 p.m., you can temper the thrill—and distraction—of new messages. Spread the news about your bold new approach with an explanation in an auto-response or in your email signature. Try something like this: In an effort to increase productivity, I am currently checking and responding to email from 11 a.m.–12 p.m. and 4–5 p.m. (EST) on weekdays. If you need urgent assistance, please call me at ###-###-####.